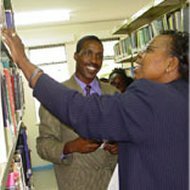 The Kenya Institute of Management is a multi-faceted management and business development organization. It's partly a business school, but also offers many other programs to advance corporate development. Their services run the managerial spectrum from education, training, motivation, and employment recruitment. Perhaps the largest part of the Kenya Institute of Management is the School of Management. Originally offering a single diploma program in Management Studies, the school has grown to provide nearly a dozen diploma courses covering management topics such as: marketing, public relations, health care, purchasing and project management. An Executive MBA program has been launched, in conjunction with the Jomo Kenyatta University of Agriculture and Technology. In the future, there are plans to offer Bachelor's Degree programs as well. There is more to the KIM than education. For those in corporate positions, there is training and consultancy services available from the Institute as well. The purpose is to aid the creation and growth of businesses, both small and large. To promote corporate and business excellence, the Institute has been awarding the annual COYA awards for the past 9 years. There are awards for numerous categories, such as leadership, human resources, and customer focus. The top company overall is named Company of the Year. The COYA awards are a prestigious element of the Kenyan corporate world. The Institute publishes a journal that covers issues and information of interest to those in a managerial position. Their main audience is middle or senior level managers, and also management graduates who are looking to stay informed about their field. Their journal has recently started monthly publication. The Kenya Institute of Management can also assist in the recruitment of qualified personnel. They manage a large database of potential employers and thousands of their members, and are able to match each job opening with members with the appropriate experience and precise skill-sets. In order to gain access to all the departments and services of the Institute, you must become a member. Membership is open to anyone, with varying levels depending on the applicant's level of education and employment position. Annual fees are required at each membership level. Membership is not required to enroll in any courses or programs offered through the School of Management. There are more than a dozen locations of the Kenya Institute of Management. Major cities like Nairobi, Mombasa, Kisumu and Nakuru all have branches. The main Management Center is located in Nairobi.